Ménaka (Mali) (AFP) - Storm clouds may lie over Britain's future relations with Europe, but British and French military chiefs say they are determined not to let this affect their cooperation in fighting jihadism in the Sahel. A hundred British military personnel and three heavy-lift Chinook helicopters are in Mali to help the French military mission in the troubled region -- a presence that France has singled out for high praise. 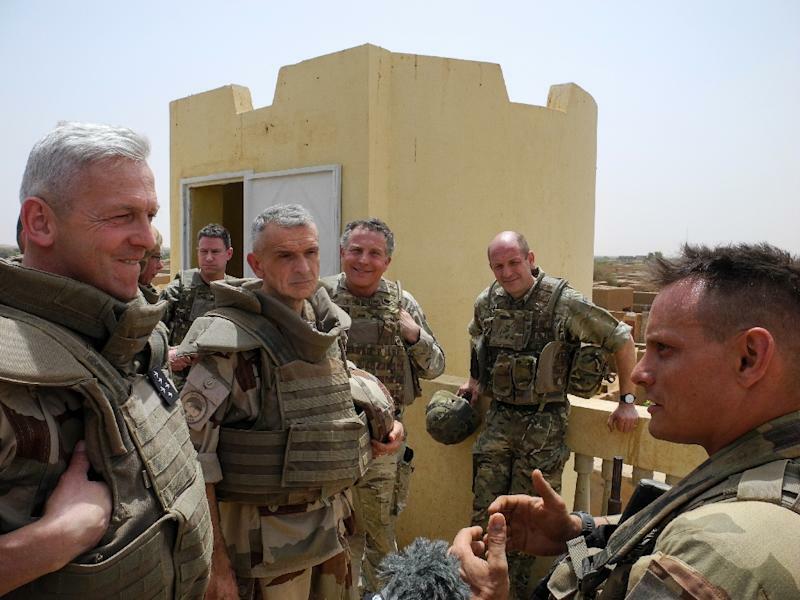 "Within Europe our closest bilateral relationship is with France," British General Nick Carter told AFP in Gao, in the centre of Mali. Carter was accompanying his French counterpart, General Francois Lecointre, for a West African tour scheduled to end in Nigeria on Friday. The countries signed a defence cooperation agreement at Lancaster House in London in 2010 -- a pact that both sides have repeatedly said will not be affected by Brexit. "Between us we are working hard to see how we can take it to another level," said Carter. The Royal Air Force (RAF) Chinooks, deployed in Mali since July 2018, have been hugely appreciated by France's 4,500-man Barkhane mission in the Sahel. The twin-rotor helicopters can haul nearly four tonnes of supplies and more than 30 troops -- a vital contribution in a region where road access to frontline troops is long, exhausting and dangerous. France sent troops into Mali in 2013 to help drive back Islamist insurgents who took control of the north of the country. Operation Barkhane remains in place, helping to support poorly-equipped local military forces, but at a hefty cost that France's European Union allies have only partially eased. "Here, very concretely, we feel European solidarity," said Lecointre before he and Carter flew to a small advance position held by French troops at Menaka, near the border with Niger. "The challenge now is to carry on nurturing this flame and to make Europeans aware of the scale of our shared responsibility across the Sahel." France is hoping Britain will extend the Chinooks' mission in Mali beyond the scheduled end of their deployment, in December. But this request is a delicate one, given the toxic political brew of the Brexit saga. "The British are in complete turmoil. This is not the right time to carry out calm, long-term planning," a French government source said. Denmark has said it will send two transport helicopters as a substitute for the Chinooks, but this needs to be approved by the Danish parliament. "The military may have a view of things, and in this perspective, we and General Carter are completely aligned. But I certainly wouldn't want to speak for the British government," Lecointre said prudently. Carter added: "Our politics is somewhat complex at the moment. "Bringing all these sorts of decisions at this point in time in our political cycle doesn't necessarily mean you'll get the answer you might want to get. "We are not going to make a decision very quickly but we'll make it in good time so that we don't let anybody down. I am here to provide unfettered military advice so when I get back to the UK I will provide our politicians with advice on how important this capability is and what it is doing in support of this mission." Jihadist insurgencies in Mali and Nigeria have spread to neighbouring Burkina Faso, Niger and Chad, sparking fears of a domino effect in the West Africa coastal states of Benin, Togo and Ghana. Carter pointed to Boko Haram's bloody campaign in northeastern Nigeria as a source of concern. "The Nigerians undoubtedly need some sort of support," he said. "There is a longer term, a more chronic problem, which is about building the capacity of the Nigerian institutions, in particular their security institutions, to be able to deal with over a long period of time. "But of course, as we all know, much of it is about how you defeat the sorts of ideas spread by organizations such as Boko Haram (and) ISIS West Africa."